As of yesterday, I have shiny new gas log set in my fireplace. While not as nice as a real fire, perhaps, I was excited to have a fire that can be turned off and on with the push of a remote button. I was always afraid to have a real fire, because what if you suddenly needed to leave the house? What if a pet needed to go to the animal hospital unexpectedly? What if you forgot something at the store and needed to run back out? What if you wanted to go to sleep? Can’t, there’s a fire burning. Which led to many nights where I didn’t even want to have a fire, only those rare times where I knew I had hours to be at home. So I splurged, gas log set it is. Because of my safety concerns about the real fires. Because now I don’t have to worry about the house burning down and everyone dying, right? Except, to work with the push of the button, to have a remote controlled fire, I have to leave the pilot light on. It’s noisy and a little fire burning all the time, and what if something happens when I’m not home and a cat manages to light its tail on fire and run around the house and I come home to a pile of embers? Same problem as the real fire. I’ve settled on lighting the pilot every time I use it, which takes some of the convenience out of the remote control operation, but I can sleep easier. Except I go to figure out how to turn it on, and there’s this warning about the imminent explosion and loss of life, which does nothing to ease my fears. But it says only if you don’t follow the instructions exactly, so I try to follow the directions exactly. Except they make no sense. “MAKE SUE THE THERMOCOUPLE AND PILOT ASSEMBLY ARE IN CORRECT ALIGNMENT WITH EACHOTHER.” Um, okay, just one question, then, WTF is a thermocouple? And a pilot assembly? And every time you smell gas before lighting, you’re supposed to turn it all off and wait 5 minutes. So after every failed attempt, I had to wait 5 minutes to try again. 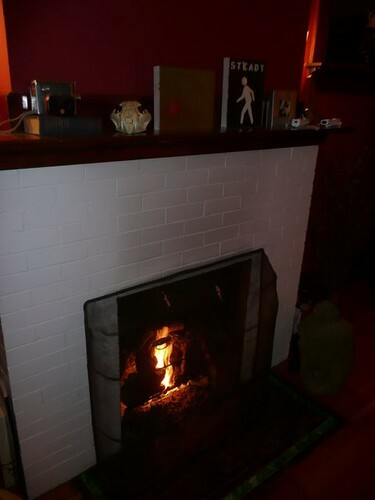 Basically there is a knobby thing with three positions, off, on, and light, except the knobby thing is in the back of the fireplace behind the logs in a position where you can’t see it that gets your arm all sooty from touching the sides of the firebox, and there’s no way to tell what position you’re in. What you do is turn on a valve outside the fireplace, stick your face over where the flames come out so you can reach the knobby thing, try putting it in a position so the pilot will light, reach over to the other side to push a piezo ignitor(?!) button to spark and eventually light the pilot. Then you have to hold on to the knobby thing for a minute so the pilot burns enough to stay lit, and then slowly turn it to the on position so the flames can start shooting out toward your face. That’s okay though, because it just goes out most of the time. Either because you didn’t hold it long enough, or because you can’t remember which direction is on. After repeating these steps 10 times or so last night, I finally managed to light the fire. I turned it off and on with the remote a few times just for fun. 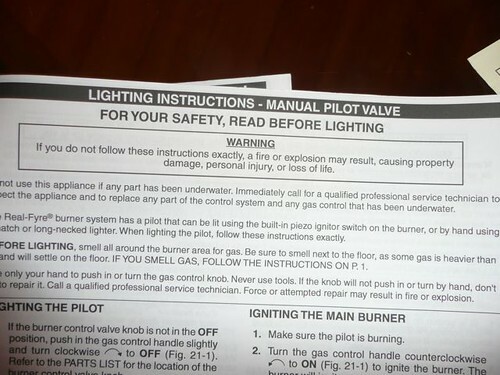 And continued to read the manual, looking for additional safety information. Is it right that the fuzz that’s supposed to look like embers catches fire a little? Are the logs too close to the flames? That’s when I found I had been reading the instructions for a totally different unit. Mine was on the next page. Still didn’t make any sense, mine has a generator instead of a thermocoupler, but I still can’t tell if they’re aligned. And then at bedtime I shut the whole system down, and I get to do the same thing again tonight. Jealous? All that aside, your fire looks nice. My god ! If we had to go through all of that with our gas fireplace I would be in the loony bin ! Ours is totally enclosed (I forget the proper technical name for it) .. but it is airtight no open flame .. enclosed with glass ? .. pilot light yes .. no noise .. no smell .. controlled by a wall thermostat .. In fact (believe me I’m nervous as hell about these sort of things) I cleaned the glass this morning so hubby could turn the system on .. we even have a separate line valve outside for the fireplace .. and a safety system that monitors it .. I haven’t heard of a “gas log” YIKES ! We have imitation logs that look very real in the fireplace. Oh, and the other thing is, I want to congratulate you on your imaginative worrying. WTF is a thermocoupler. Sounds dirty. hahaha Sometimes Texas isn’t all that bad. Haven’t lit a fire, besides in a BBQ pit, in yeeeeeeeeears. So I assume you have an electric stove? Because otherwise I assume you are also blowing out the pilot light on the stove nightly? Joy – Glad somebody else understands. From what I’m told, you have a gas insert, which is totally enclosed, but my old firebox only fit the gas log set. Yours sounds safer. James – I think it’s probably a made up word. nonlineargirl – Wow. Touche. Nice one. And also, probably what I’ll do when I convert to a gas stove. But yes, I think we all have crazy fears, I don’t know what I’d do without them. You seem to be much more patient than me. We have one of those gas log thingies too and have never turned it on. I don’t even light candles anymore, I’m such a fraidy cat about fires. I hope yours becomes simpler to operate and you end up feeling like it’s safe. It does look cozy, and I love your mantle (is that a skull I see? what type is it?). Chris – I’m serious about having a drink in front of the fire. Other than that, no patience at all. Karen – That is a faux cheetah skull, a resin replica. I got it at a shop called Evolution in Soho. It’s one of my favorite souvenirs.